Every entrepreneur is excited to be their own boss and then we learn about the daily grind that requires us to have the discipline of self leadership so we can perform at our peak. This is no small feat. As a business owner you are wearing multiple hats, problem solving, creating, and executing all day long with high energy output. If we were never taught about how to run a business in the first place and then add on to that how to lead and manage ourselves, imagine where that leaves us? Yes, running around in a dither trying desperately to keep up with it all while keeping a smile on our face and slowly running out of steam. However, entrepreneurs can develop self leadership skills and learn how to have peak performance. Learning these will energize and elevate you to the next growth level in your business and empower you to achieve your goals. 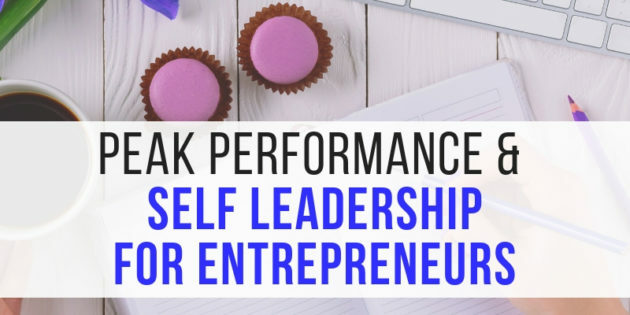 In this video for entrepreneurs, you will learn three self leadership practices that will increase your energy, health, and mindset to elevate you and your business. You will also develop your own peak performance measurement and discover how every entrepreneur needs to implement structure and systems for themselves in order to make progress towards their goals. Discover the action steps you need in your business to grow and your own personal system for implementing action daily, weekly, and monthly. Are you ready to develop self leadership and peak performance in your business? If so, watch the video below and comment with your first action step.